This is an enjoyable quick read, especially for the fans of mafia stories. The story is well-written, plot moves smoothly, and well-narrated (Audiobook) by Christopher Strong. I'm very proud of the fact that the STARLIGHT CLUB won the silver in the 2012 eLit contest in the 'TRUE CRIME' category'. In 2013 it won HONORABLE MENTION in the Reader's Favorite 'HISTORICAL FICTION' category'. In 2014 it was an IPPY award FINALIST and it was awarded the Gold Seal as a Eric Hoffer MONTAINGE MEDAL FINALIST. It also won FINALIST in the 2014 (NIEA) National Indie Excellence Awards in the CRIME-FICTION CATEGORY.Many of the characters in the book were real as were some of the incidents. I met Jimmy the Hat, a member of the Gallo gang once many years ago, and I liked his name and made him a central character in the book. When the Gallo-Profaci war happened Crazy Joey Gallo spread his men out over the five boroughs (including the Starlight Club in Queens) so they couldn't all be gunned down at the same time. The book was written as a stand alone book and was never intended to be turned into a series - but that's what happened. I thought I'd lose the female reader but to my surprise and delight, they're the majority of the books readers.ABOUT THE BOOK. "The mob’s fondness for each other is convenient, given that they speak the same language, but how does that impact the gang wars? Territory disputes pose a distraction. Carlos Rodrigo’s Latino gang members make the biggest mistake of their lives. Bones are crushed underneath the car by a merciless Italian hit man. Trenchie picks up right where he left off.The mafia and their power, is a match for anyone (even Lieutenant Rocarro of the NYPD), but the irony of their human side isn’t lost. “Ya’ know, Jimmy, the right thing would have been to shoot him in the head and put him out of his misery. It just ain’t right to leave a man in the Everglades like that, with blood an’ all. You know what’s wrong with me? I’m too damned soft hearted, that’s what’s wrong with me. I care too much about people and that’s a weakness I have to work on.”Perhaps we'll meet at The Starlight Club? I’ll show you where it all happened. There will be a huge celebration as we are all preparing for The Starlight Club’s success. Book Review originally published here: http://www.iheartreading.net/book-tou...I’m not usually one for maffia movies, or books, but Joe Corso has managed to convey a truthful and believable portrait of mobsters and gangsters in “The Starlight Club“, a book that was apparently never meant to be a series, but turned into one. Considering how well this book was written, and how easily the characters came to life on the pages, that didn’t surprise me.The book is partially true crime, partially fiction. Some of the characters mentioned are real, others are fictional, but it does give an honest account of what happened during the mob wars in the 1960s. Filled with violence, action, supsense and intrigue, it’s a riveting account of a mobster’s life and the tough choices they had to make to survive.The writing was spot on, the characters were intriguing and had surprising depth. The pace was high from the start, and didn’t slow down once. The book is well-researched, and some scenes sound so authentic one might wonder if the author had perhaps witnessed them for real.The only thing that slightly bothered me was that it’s a story within a story. Normally I’d be okay with that, but here, the narrator of the story vanishes for most of the book. We’re not reminded that it’s actually him telling us the story, and he even relates some events that happened while he was not present, or probably not present. All in all, it didn’t bother me that much, but it did turn this from a 4.5 into a 4 star rating. Action packed and a fantastic read!Set in present day. Robert ‘Bobby’ Valentine has asked his daughter to come to New York so he can tell her about his life...Sitting in an Italian Restaurant, which used to be The Starlight Club, he looks back over the years, and reminisces about life in Queens in the early 60’s and the people who lived there.As the story unfolds we find ourselves drawn into events at the club, we’re permitted through the power of the story to go back in time and take a glimpse into the hard world of the Mafia families.Somehow, if it is possible to do so, in a nice way, the author has produced a riveting read, full of violence and action packed. The essence of life in Queens is captured at a time of great unrest and warfare, where murder was not personal – it was just a job, which had to be done.This book was a thoroughly enthralling read, filled with amazing characters like Big Red, Trenchie and James Roman (at the time the latest movie idol).There’s even a guest appearance from George Raft! I can only hope that there are more stories like this one to come. Kindle free download - 12/1/15. `The Starlight Club was a magical place - movie stars, politicians and yes, even gangsters came to dine.' US Army Korean Veteran, retired Fire Department of New York Firefighter, author Joe Corso has lived the life about which he so successfully writes. No, not he emphasis on mafia and gangs as a participant, but entrenched in that soil he describes so well. He grew up in Queens, New York and after retiring moved to his current home in Florida where beginning at age 75 he has written some 15 books and 9 short stories with many more on the way. He writes westerns (THE ADVENTURES OF THE LONE JACK KID + sequels), fire stories (ENGINE 24 FIRE STORIES), time travel (TIME PORTAL series), baseball (THE COMEACK), fictional historical blended with crime novels (LAFITTES' TREASURE) and more. But THE STARLIGHT CLUB won the 2012 eLit True Crime category, and an honorable mention in the 2013 reader's favorite book contest, and though there are at least five sequels, this is Book 1 where all the hullabaloo started.Corso's story starts in the present when Bobby Valentine brings his daughter Lynn from Florida to Corona, Queens, NY in the dead of winter, stopping by a restaurant that Bobby describes to his daughter as The Starlight Club of the past. And so Joe Corso provides an entry to Queens 1961 - the time of the height of the infamous Starlight Club and we are off and running in a non -stop action gang drama that is written just about as good a it gets! So much happens so fast in this pinnacle gang crime novel that borrowing a synopsis from the author's website seems fitting to get the reader `s attention. `The Starlight Club was jumping . . ."They looked like mob guys. They had that arrogance exuded by those who liked to intimidate - those who were the proud purveyors of fear." Amidst the nightly gaiety was the back room, where business deals were made, hits were ordered, and territories were divided. Trenchie not being a "rat" is just released from his ten-year prison sentence. A new life is waiting - complete with envelopes of money and a steak house to call his own. He finds the woman of his dreams who brings along ex-husband baggage. Hit man Jimmy The Hat finds unexpected fame in the most unlikely of places, yet he always stays true to the "boys", especially Big Red. "Crazy Joey Gallo" and his brothers break away from the Profaci family and go "rogue, on their own now. They split their gang into several small groups and spread them out over the five boroughs." Corso tells the story of a group of mafia members, all taking place in and around a club called The Starlight Club. Some of the characters passing by in the book, are based off real, existing mafia members, which made the book all the more intriguing.' The author clearly did his research. In his closing, very touching Epilogue, Corso returns us to the present as Bobby says, `You see Lynn, I was one of the guys who hung around The Starlight Club. I was young, I minded my own business, I never asked any questions, I kept a secret and everyone knew me because I was there every day....He said softly to her. "The Starlight Club is gone now and all the players are dead. "So why all the hoopla about this book? Because it is written without the attempt to stand as `the great American novel' but rather as a slice of our history (actually extant...) that is so rich in flavor and action and excitement that it is mesmerizingly entertaining. Joe Corso has his finger on the right trigger. Read him. 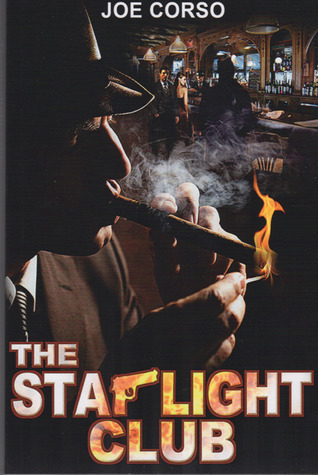 The Starlight Club tells the story of a group of middle level Mafia bosses and henchmen, in and around the club of the book’s title, in Queens, New York, during 1961/62. Although the central characters and story are fictional, the story is set in the context of an actual war between the large Mafia families of the era, and these events sometimes impinge on the story, and some real life characters occasionally stroll across the stage. In general the author has researched the historical context quite well. This all gives the story a very realistic flavor and is quite fascinating , and makes the reader want to look deeper into the context. At the same time, however, it puts a lie to the author’s disclaimer (inside cover) that “All characters appearing in this work are fictitious. Any resemblance to real persons, living or dead, is purely coincidental.” The Gallo brothers, Joseph Profaci and Carlo Gambino – these are real life characters, and the story benefits greatly from their presence. Among the fictional characters, the main protagonists are: Big Red, the proprietor of the club; Trenchie, a hitman just out of prison; and Jimmy the Hat, who, in the course of the story becomes a Hollywood star.The 1961/62 story is framed within a brief Prologue and Epilogue, in which a minor player, Bobby Valentine, now an old man, relates events to his daughter during the present day. Bobby is only a very minor character in the main story. This is a good idea, but would have worked better if there were a few more reminders throughout the story of Bobby’s occasional participation in these events. As it is, Bobby does not appear to have been a witness to most of the events he is (apparently) relating, and this may bother the reader. This is not Shakespeare, but the almost “blokey” way in which the story is told works quite well, given the genre. Having said that, the attempts at describing romance are a little awkward. The story works best when the author is describing the more violent scenes: fights, executions. These work very well. The main characters, murderers, thugs, henchmen, are actually quite endearing. I was drawn into their particular world, with its distinctive code and values. I liked them. I cared about what would happen to them. I wanted to read on.Note that the errors in the book, mentioned in previous reviews, have now been largely corrected.In summary: the basic story and characters drew me in. The writing is not always polished and stylish, but I could mostly overlook this. I give this book four stars out of five. This was a fascinating tale of Mafia life in New York in the 1960’s. I was particularly intrigued with how much different I viewed the mobsters as I was reading the book and the way I have learned to view the mobsters through the news and historical documents.Joe Corso did an admirable job of telling the stories of these men and women. He enabled me to see another side of them that wasn’t typically visible to the general population. They could be vicious and cruel, but they were at the same time chivalrous kind. “Red was a strange kind of criminal. He could shoot a guy I the head while eating a salami sandwich but couldn’t drive past a woman stranded in the rain with a flat tire, without stopping to help her. He was a contradiction like with the kid.”I found many of the members in the mob such as Trenchie, Big Red, Jimmy the Hat and others to be likeable, honourable, loyal, trustworthy people. Strange when I also know that they were murderers and criminals. I was impressed with their undying loyalty to one another. Jimmy demonstrates that kind of loyalty when he says, “I was told not to leave the hospital but you see, I promised to give the bride away tomorrow, and what kind of a guy would I be if I didn’t keep my promise?”It was very interesting finding out how things worked between mob families and how they made deals with each other and helped each other out, and then could turn around and kill one of their friends because it’s “just business”.Many parts of this novel are true. Some parts are fictional. The author is the real “Bobby” in the novel. Joe Corso does an excellent job of weaving the parts together to create an interesting, absorbing read. The book flows nicely. I also liked how Corso framed the book at the beginning and end with the storyteller “Bobby” and his daughter.I thoroughly enjoyed this book, and would definitely consider reading the other books in this series. I gave this book a rating of 5 stars.Thank you to the author who gave me a free copy of his book in exchange for my fair and honest review. A free product does not influence my opinion. All thoughts are my own. A world where honor and respect are everythingI have to admit that I enjoy period pieces. Whether it’s the struggles of race and classes in the building of New York City to the progression of the railroad across the country, I enjoy the historical aspects—even the fictionalized one. “The Starlight Club” is a fun period piece that takes place in New York City during one of the heights of the gangster era. Told in flashback, from the perspective of an outsider (sort of), Corso provides us with a marvelous glimpse into that era complete with language and dialogue appropriate to the period. While at times, it’s obvious the story is being told in flashback, Corso does an excellent job of crafting a story that has the reader feeling like we are sitting in the Starlight Club watching all this take place. Readers of “old school” gangster stories and lovers of period pieces, especially anything to do with New York, will get a kick out of this story and I definitely recommend it, it was a fun read. I do think that the story could have benefitted from a final proofread/line edit as there were numerous issues (especially toward the end) that I had to re-read in order to figure out what it was supposed to say. But other than that, it was a great read and one worth picking up. Bobby Valentine used to deliver meat to The Starlight Club a place where deals are made and hits are ordered. As he reminisces he shares his memories with his daughter. The time was the 1960’s when the mobs ruled the streets and the police. A time of nicknames as no one used their real names Trenchie, Red, Frankie the Cop, Jimmie the Hat and so many more. A story like no other as it swirls around Trenchie. He has just been released from prison serving ten years for a murder he didn’t commit to protect his boss Yip. Trenchie is ready to step back into the role he had before of protecting the mob family around him. Then he meets Mary..Intense, captivating and intriguing can’t begin to describe this amazing story. With a writing style similar to Mickey Spillane I couldn’t help but fall in love with the writing of Joe Corso. He writes with a flair that draws his readers in and whisks them back to the 1960’s mob scene a page-turner that you’ll never want to leave. Not only is the main story amazing but even the underlying tale is superb. From excellent characters, rich and powerful storyline this tale has it all. As great as “The Starlight Club” is I can’t wait to read more! At once, an unsettling and fascinating close-up look at the NY mob in the 1960s. Joe Corso draws on his own experiences and memorable characters from his past to thread a story of loyalty, murder, revenge and justice as seen through the eyes of a cast of colorful hitmen, made men and outright losers. Told in an easy-going anecdotal way, the stories are skillfully interwoven, introducing the reader to various elements of the underworld with accounts so detailed you could swear Mr. Corso was there in person. From planning a wedding to gangster rubouts, the tension builds through to the end. You can't go wrong once you enter The Starlight Club, and you better be prepared for mayhem, because it's not personal, it's just business. I love a great mobster story, and I'm not alone. It seems like books and movies like "The Godfather" and "Goodfellas" are always popping up and I always enjoy them. The Starlight Club fits right into this genre and is as good or better than any of them. It is an extremely well written book, which you can see from the first paragraph, and keeps you interested until the last sentence. Joe Corso has done a great job developing believable and colorful characters, and an entertaining and interesting storyline that will make you ready for the sequel (and you will not be disappointed). Highly recommended. First-reads book. Three Stars. I liked how the book was worked around a father telling his daughter about The Starlight Club. It made it seem more real, that reminiscent touch. It was a fun read and I would probably given it four stars if the editing had been better. For example, there was a period in the middle of a sentence so it read 'and. What...' Other places you could tell a phrase was reworded because not all the previous words had been deleted. I felt that those errors took a little bit away from the story so am giving it a three instead of a four. Well writtenThis book was on my phone. I read it while I waited for doctors or other appointments that where never quite on time.It is well written. The characters strong,it worked well to keep your interest. A great story of reminiscing since it was told by some one of my age. It told how things where and how all that is left are our memories. Will look for other books by Joe Corso. Crime FamilyJoe Corso did a nice job writing this novel about the workings of a crime family. Twists and turns throughout the book. The book is only okay, but the typos and grammar errors detract from that. The Star Light club was an old man's look back at when he was young and used to hang out at a bar where mobsters from New York ran their business. I found to to be an entertaining read. Joe Corso - Koren Veteran, FDNY Retired, I grew up in Queens,New York and my motivation to write came from my wish to help my grandchildren pay for their college education. So far I've completed 16 books and 9 short stories including my popular 'ENGINE 24 FIRE STORIES' trilogy and I've just finished the 5th installment in the 'TIME PORTAL' series as well as LAFITTE'S TREASURE which is presently being edited. THE STARLIGHT CLUB 5: The Nazi has been published. I'm in the process of writing a sequel to my award winning western 'THE ADVENTURES OF THE LONE JACK KID', titled 'THE RETURN OF THE LONE JACK KID'.